Over at Danger Room, Noah Shachtman has a great post on how activists both inside and outside of Iran have taken what is now being dubbed the “Green Revolution” online, and the various ways that these cyberattacks could potentially backfire. Pro-democracy activists on the web are asking supporters to use relatively simple hacking tools to flood the regime’s propaganda sites with junk traffic. 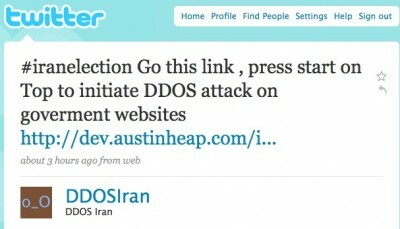 “NOTE to HACKERS – attack www.farhang.gov.ir – pls try to hack all iran gov wesites [sic]. very difficult for us,” Tweets one activist. The impact of these distributed denial of service (DDOS) attacks isn’t clear. But official online outlets like leader.ir, ahmadinejad.ir, and iribnews.ir are currently inaccessible. “There are calls to use an even more sophisticated tool called BWraep, which seems to exhaust the target website out of bandwidth by creating bogus requests for serving images,” notes Open Society Institute fellow Evgeny Morozov. For the moment, however, those connections are still live. And activists are using them to mobilize mass protests in Tehran. Link to Twitter search for hashtag “IranElection.” Some Twitterers I’m following on this issue: @persiankiwi, @ johnperrybarlow , IranRiggedElect, @Pouyan.